Joe Nathan. Jon Rauch. Matt Capps. Glen Perkins. Brandon Kintzler. Fernando Rodney. The names have changed, but without exception, the Twins have opened every season in memory with a designated closer. In 2019, it appears that will change. "Knowing where guys slot in a game is helpful, at least generally from a parameter standpoint. Guys knowing what they’re preparing for and what role they generally play," said Derek Falvey on Wednesday. "But I know Rocco (Baldelli) and Wes (Johnson) have already had conversations with our guys around their role and the way they want to go about it." 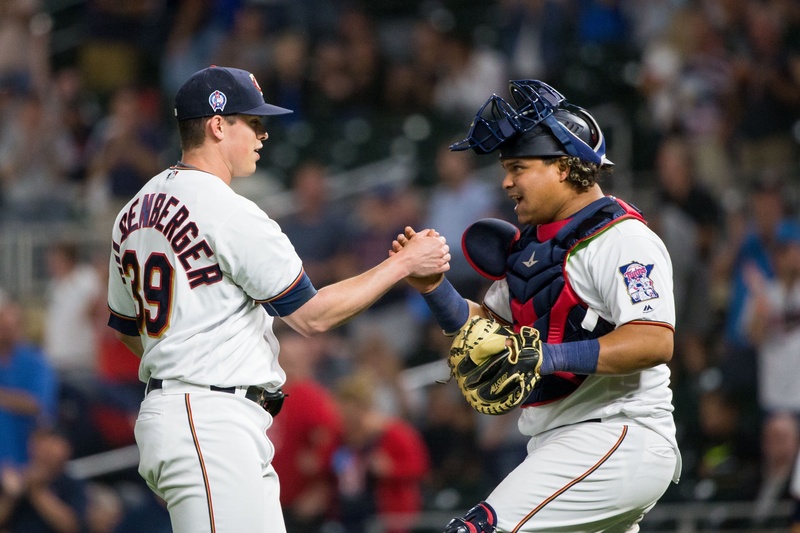 The head Twins front office exec continued: "A few of our guys know they’re going to pitch in the back end of games, and that could eventually evolve into a more set person as we go. But as it stands right today, I don’t think Rocco is ready to name that. I’m comfortable with that if he is." It appears that Baldelli is indeed comfortable with this plan. To see a rookie manager eschew such an entrenched convention of the game is surprising and, frankly, rather refreshing. Many analytical thinkers believe that the save ruined relief pitching, and I am of the same mind. When you reserve your best reliever for the end of the game, you risk letting leads slip away at pivotal moments while he stagnates in the bullpen. Of course, just because Baldelli and the Twins are ready to enter the season without a defined closer doesn't mean it'll stay that way. The point made by Falvey is an undeniable one: relief pitchers like to know their roles, and unpredictability can lead to tension and frustration. As such, it is likely that Minnesota will eventually settle on a primary ninth-inning guy (though hopefully Baldelli will never be overly stringent or rigid in his usage). Let's handicap that race as Opening Day approaches. Here are, in order, the guys I'd expect to accrue saves for the 2019 Twins. With so little clarity among the top candidates, it's pretty tough to pick a true favorite, but Parker is clearly in the back-end mix that Falvey spoke of. He is also an experienced veteran with a 2.90 ERA and 22 saves over the past two seasons. Parker has pitched well this spring with a 10-to-2 K/BB ratio and only four hits allowed in 7 2/3 innings, so his manager has to be feeling confident in what he's seen. From my view, Hildenberger is the best choice to handle the ninth on a regular basis. He throws strikes and gets grounders, making it tough for opponents to string together rallies and post crooked numbers against him. In his first 73 appearances as a Twin, spanning about one calendar year, Hildenberger allowed multiple runs in an outing only five times. Of course, he then did so 10 times in his final 37 appearances last season, so he's got to regain the team's confidence. If and when he settles back into his groove, I think he's the guy. May finished the 2018 season as closer and looked damn good in that role, converting three straight saves in the waning days of September and not allowing so much as a hit in any of them. He's the kind of strike-throwing and bat-missing force that can offer safety with slim leads in the ninth. But there are two issues at play: 1) When he's on his game, he's also the kind of gas-hurling force you want to unleash in the highest-leverage of spots, which aren't always the ninth, and 2) He hasn't been on his game of late, with four walks and five hits allowed in 2 2/3 innings over his past four appearances. He looked noticeably flustered while struggling to find the zone on Wednesday. With a well established guy, you'd make nothing out of a brief ugly stretch late in exhibition play. But May is not that. He is Minnesota's best reliever. I don't think there's any question about that. So in a very traditional sense he'd be the logical pick for closer. But it seems telling that, even while he was almost completely untouchable during the second half last year, the Twins never really gave him a look as Rodney's replacement. That's because – more than anyone else in this unit – he's the guy you want to roll out in those most crucial of spots: runners on, big bopper coming up to the plate. Last year Rogers had the ninth-highest Win Probability Added among all MLB relievers, illustrating the way he thrived in leverage. Perhaps most importantly, he is absolute death to left-handers (allowed ZERO extra-base hits against them in 110 PA last year) so the Twins will want to have him available for key matchups. WIth that being said, I expect he'll get a few save chances in situations where two or three lefty hitters are due up in the ninth. That's the beauty of staying open-minded with this role. Down the line, I believe the Twins envision Romero taking over as their long-term closer. They see him as a big, overpowering, imposing presence with the "bulldog" mentality that teams love at the end of games. Kenley Jansen is one name I've heard thrown around as a (very optimistic) comp. And while that might be a bit of a stretch, Romero does fit all of the aforementioned descriptors, and the idea of his stuff playing up in the late innings caused many (including myself) to think it might happen quickly. Falvey threw some cold water on that hype on Wednesday. "I don't know that we were viewing him as the back-end guy right at the outset," he said. "A lot of people think he had the stuff for it and the ability. I think you grow into those roles." The CBO mentioned Romero's name in the same breath as Adalberto Mejia, so it sounds like a middle-inning longman role might be more likely out of the gate – IF he makes the team. That's now somewhat in doubt, because while Falvey was holding court with media amidst Wednesday's game, Romero was getting torched for a second straight outing. He's suddenly lost his ability to find the zone. And while it's only spring training, the same thing applies as with May; more so, in fact. Romero doesn't have any track record as a reliever, so the Twins could very well send him down to get a little more acclimated. When Falvey was asked whether fans should expect anyone other than Miguel Sano and Gabriel Moya (who's battling shoulder tightness) to open on the Injured List, he mentioned that it's "possible there may be one more in that group," and then grinned conspicuously, which seemed to indicate there will definitely be (at least) one more in that group. Some of us inferred he was talking about Reed, because the guy hasn't looked right all spring after not looking right for most of 2018. If healthy and throwing well, Reed would be at the top of this list, since he's a veteran with an excellent track record and plenty of history closing games (125 career saves). But he's very far from throwing well right now, with 10 earned runs allowed in 5 1/3 innings this spring, and given that an offseason of rest didn't seem to help much, it's tough to imagine what non-surgical solution is going to get him back on track at this point. The sleeper. Enjoying a great spring, his odds of making the bullpen are greatly bolstered if Reed and Romero (or Matt Magill, who may also be ailing since he hasn't pitched in a week) do not. Harper's buzz isn't entirely a result of his strong work in eight innings this spring (11 strikeouts, zero walks, zero earned runs); he was also quite impressive between Double-A and Triple-A last year, posting an 86-to-10 K/BB ratio with only two homers allowed in 65 innings. Granted, he also turns 30 next Tuesday and hasn't yet pitched in the majors, which is why the sleeper label needs to be strongly emphasized. But if he shows well early, reserving him for those less intense save opportunities (multi-run leads, or bottom part of the order due up) would make plenty of sense, and would enable Baldelli to focus on keeping his most powerful arms available to put out fires. I'd bet on May, if he stays healthy. Otherwise I don't mind having no specific closer. I agree that every relief pitcher should consider it his job to go get guys out whenever called upon. I'll guess that May and Parker will get the first chances at closing, with Rogers being used as the "lethal weapon" or whatever we're calling the Josh Hader role. With the way Hildenberger pitched in 2018, I think he's a dangerous bet to be throwing out there in high leverage situations in the 9th (but it's clear that he will be throwing in those types of games, thanks to the roster construction). I'm also happy to be done with locking a reliever to the 9th inning. It bugged me how Molitor would always go to the same guy, even on short rest or after a really shaky outing (lookin' at you, Rodney!). But I don't like the bullpen options this year, and it won't take much for the pen to fall apart this year. There is going to be a lot of frustrated fans if Romero is in the AAA bullpen. If we are considering a closer for the long term, then why didn't we get one?I am very unhappy with entering the season as closer by committee.More than anything a closer has a mindset for the role.I don't see how you achieve that with a committee. While I think saves are overrated, I'm not opposed to a closer. I just don't think it has to be the best pitcher on the staff. Rodney has made a career of it, and Guardado had a good run. I'm a fan of that philosophy. Basically, find an above average arm with that mysterious personality trait to forget about their bad games quickly and move on. I'm also totally fine with the committee situation at the moment. It'll sort itself out, just like the many other questions on this team. I am not so sure the save stat ruined baseball. There is a reason managers found guys to finish games and not every reliever thrived in that role. There were relievers who typically finished games long before the save stat was invented. There is nothing more deflating than going into the ninth inning with a lead and then losing the game. Not every pitcher handles being the goat that well. I dunno how the new age pen will work out. It sounds good in theory and on paper, but in practice, with real people, the human element is still somewhat unknown. Relievers are sometimes a shakey sort reliant on confidence, routine, and even superstition. est bull pen arms. It's also not clear how arbitrators, general managers, and agents will test the new strategy that deemphasizes closers. with Rogers being used as the "lethal weapon" or whatever we're calling the Josh Hader role. I like Rogers, but I don't think it's right to invoke a Josh Hader comp for him right now. His K rate has peaked at 28.9% so far, with a big platoon split (36% vs LHB, 23% vs RHB). Hader was 46% against RHB last year, and 48% vs LHB. Then there's usage -- I'm sure Baldelli will make some changes in usage, but Hader has pitched 2+ innings, and thrown 30+ pitches, a lot more than Rogers, and basically came into that role at age 23 straight from starting in the minors. Rogers is 28 years old and 3 years removed from a notably larger workload. They might do some tweaking with his deployment here and there, but I suspect Rogers will be used like a more traditional top setup man more than a Hader type role. The save didn’t ruin relief pitching, the idea that a closer must pitch one inning did. While they're at it, they should take the numbers out of drinking too -- no more 3.2 beer! Don't mess with my Bacardi 151!! Thad Levine is 47. He's getting a little old for knee pants by now. You became too accustomed to Fernando Rodney. If the closer does his job, there won't be another inning. What about 2-3 inning saves tho?? Frankly, I think the best case scenario for this bullpen is to be average and worst case is to be a disaster. While I do believe a closer is overrated, and a save to some degree, not everyone can handle the position. Sure there are "cheap" saves, but there are also 1 run leads and heart of the order or PH options as the other team attempts to rally. Its not as simple as "anyone can do it", and firemen shouldn't be closers. (NOT that you are saying that Nick). Its still an important job. Seems to me Parker or May are the obvious considerations, but I feel it's going be fluid for now and settle itself organically. Not on Hildenberger: Even the good throwing Hildy might not be the best choice. All those ground balls you mentioned could be excellent in the 7th or 8th to kill any potential rally early. Buxton left game with injury after a collision with Xander bogaerts. The 9 th inning is simply different. Just ask LaTroy Hawkins. Great reliever. Great stuff. Melted under 9th inning pressure. Fluorished setting up Eddie, who had nowhere near the raw stuff of Hawkins. Some guys just don’t have it upstairs. Some do. That’s why the ones that do are still going to get theirs. Agree. What did Yogi say? "Half this game is 90% mental"? How many did I have last night? Ah doesn't matter! Back in the Dark Ages (1970) before teams decided they needed 12-13 pitchers, the closer combination of Ron Peranoski and Stan Williams was 17-9 with 49 saves. They each pitched 67-68 games and each had just over 110 IPs.And somehow they often pitched more than one inning in a game. May and Rogers for closer combo until they prove they can't handle it. → Article: Report From The Fort: Closing Time?